First chance I've had to acknowledge your kind & thoughtful cable also the lovely flowers for Eda - Deeply appreciated Booth, it was very sweet of you - Many many thanks. The flowers were sent from Penzance, I wondered at first what the hell you were doing down there! Happy to tell you the act was a huge success & has been every show. We are doing capacity Bus. - really wonderful our popularity over here. Needless to tell you, I am getting a thrill out of it - a new lease on life, after sitting home for months watching my garden grow! Glad to tell you - I am feeling good & no ill effects from the hard work & anxiety I went through before opening. It was quite a strain & you know what I mean. Got a big bang out of your cable re "another nice mess." It was cute. Enclosed is the local press review of the opening, & program of show. What's doing with you Booth? It's time you are getting lined up again - How about more TV Shows? Why don't you go after the "Disraeli" idea! I feel sure it would do you a lot of good, as all the Producers see you - it is a great show case. All for now Booth - near matinee time & the kids are waiting! Will write more later. Eda joins in love & thanks - We think of you often. Just a wee note to let you know how much I enjoyed meeting you yesterday at the Memorial Club. It was indeed a great pleasure Harry & I certainly appreciated your kindness & courtesy & I hope it won't be long before we meet again & I shall have the opportunity to reciprocate. The club is delightful & enjoyable, a great credit is due you & all involved for a wonderful thought & gesture which could only be conceived by a Swell Guy. It certainly was a nice surprise to hear from you & needless to tell you I got a big kick out of the old Day Bill you enclosed. I surely do remember the show & all of you in it, could never forget it, my first Panto. In fact, I still correspond with the few there are left. Georgie Wood was in Hollywood before I left for this trip, & was down at the station to see off, he looked just the same, only a couple of weeks older! I hear once in a while from the Gibson family and Bennie Barron. Jackie Adamson is living in Byker, I just recd. a letter from his daughter telling me, he has been paralyzed for almost five years, so am going to visit him before I leave, poor chap. I hear quite often from Jackie Harrison too, I saw him in Manchester when we were here in '47. He looks just the same - only a month older than wood!! I should talk, I'm beginning to look like the Wooden Dolly in North Shields. Happy to know you are going to be in to see the show in Sunderland March 27th, & will be very disappointed if you don't come round to see me. I am returning herewith the Day Bill, & appreciate you sending it to me, it's wonderful how you have kept it all through the years. All for now Trixie, thanks for dropping me a line, it was very sweet of you. By now, & God bless. Many thanks for your kind letter. It will be our pleasure to meet you for a few minutes any Eve this week. Kindly present this to the Stage Door Gentleman. Wish you were here to see the show . It’s going wonderfully well. Even I am surprised! Just recd. yours 15th. inst. Had a wonderful week in Glasgow, Bus. terrific also Newcastle. Opening at above today - Big advance sale. We are certainly very lucky as the Theatre Bus. is awfully bad here in this Country - not due to TV, but things are tough financially. It's really amazing the popularity we have here. The name seems to be quite magic! We read of the rain Dept. you are having - hope not as bad as the one before we left, that was terrible. I wondered why your letter was soaking wet when it arrived! Glad to hear you were in touch with Randy & Ida Mae, you should go & visit them - they would be delighted! Also 1111 Franklin - Lovely people. Wish you were here to see the show - it's going wonderfully well - even I am surprised.! All for now Booth - Do hope you will get started again real soon, but as I told you - don't lay around there. Trust you will have success in "Zenda" & enjoy doing it. Write soon again - always happy to hear from you. P.S. Nobody here has been ill - [Louella] "Parsons" as usual - true to form. Well give her credit for getting the name right! Hello dear, dear Booth: Thank you for your sweet letters and the flowers—your sweet thought touched me very much. Finally, I can breathe the ocean air, our hotel just right on the beach but too cold to swim and no sun. Our room is in penthouse. Well I am quite busy with all the packings every week. Lots of Stan’s old friends coming—you have to talk, smile, be sweet with everybody, quite a job. Sorry to know that you still waiting for a job, it is awful, but, chin up. Please write to us as often as you can. Love to hear from you. Why you don’t write the Keatons, they like you. God luck to you Booth. Much of love, Ida—I was ill in London with a cold. Feeling good now. Stan is OK—working very hard. That weather out there is really becoming a problem. Am really beginning to think that the Atom Bomb Tests in Nevada have something to do with it. 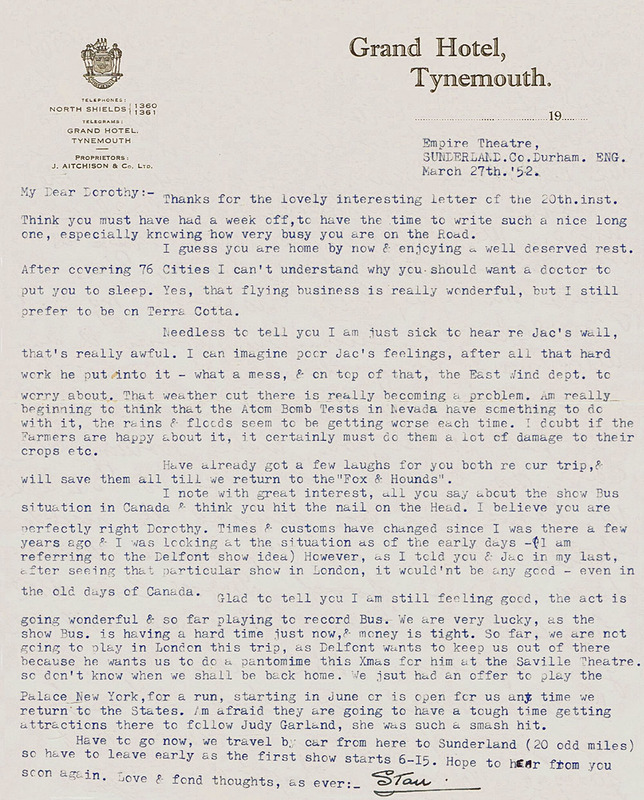 Thanks for the lovely interesting letter of the 20th.inst. Think you much have had a week off, to have time to write such a nice long one, especially knowing how very busy you are on the Road. I guess you are home by now & enjoying - well deserved rest. After covering 76 Cities I can't understand why you should want a doctor to put you to sleep. Yes, that flying business is really wonderful, but I still prefer to be on Terra Cotta. Needless to tell you I am just sick to hear re Jac's wall, that's really awful. I can imagine poor Jac's feelings, after all that hard work he put into it - what a mess, & on top of that, the East Wind dept. to worry about. That weather out there is really becoming a problem. Am really beginning to think that the Atom Bomb Tests in Nevada have something to do with it, the rains & floods seem to be getting worse each time. I doubt if the Farmers are happy about it, it certainly must do them a lot of damage to their crops etc. Have already got a few laughs for you both re our trip, & will save them all till we return to the "Fox & Hounds". I note with great interest, all you say about the show Bus situation in Canada & think you hit the nail on the Head. I believe you are perfectly right [Dorathi]. Times & customs have changed since I was there a few years ago & I was looking at the situation as of the early days - I am referring to the Delfont show idea) However, as I told you & Jac in my last, after seeing that particular show in London, it would'nt be any good - even in the old days of Canada. Glad to tell you I am still feeling good, the act is going wonderful & so far playing to record Bus. We are very lucky, as the show Bus. is having a hard time just now, & money is tight. So far, we are not going to play in London this trip, as Delfont wants to keep us out of there because he wants us to do a pantomime this Xmas for him at the Savoy Theatre. so do'nt know when we shall be back home. We just had an offer to play the Palace New York, for a run, starting in June or is open to us any time we return to the States. I'm afraid they are going to have a tough time getting attractions there to follow Judy Garland, she was such a smash hit. Have to go now, we travel by car from here to Sunderland (20 odd miles) so have to leave early as the first show starts 6-15. Hope to hear from you soon again. Dorathi Bock Pierre was a theatrical publicist and dance writer married to Jacques J. Pierre, a theatrical producer. The Fox and Hounds was a restaurant popular with actors located at 2900 Wilshire Boulevard in Santa Monica, California. Judy Garland (1922-1969), most famous for her portrayal of Dorothy in MGM’s The Wizard of Oz in 1939, played a critically-acclaimed 19-week engagement at New York’s Palace Theatre starting in October 1951.